Utagawa Toyoharu (1735–1814) was a Japanese printmaker and founder of the Utagawa school. 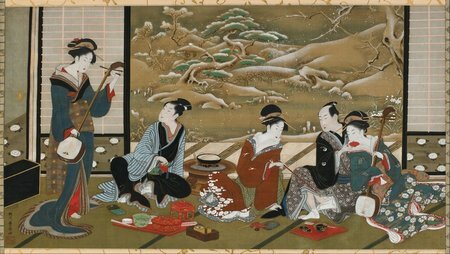 Born in the Kansai region of Japan, he studied in Kyoto under Tsuruzawa Tangei, a Kanō school painter, before moving to Edo in 1760. There he continued his studies under Toriyama Sekien. Toyoharu played an important role in the development of Ukiyo-e by studying western linear perspective in his Uki-e prints. Engravings after the venetian vedutisti such as Canaletto and Guardi were his primary source of information about perspective. He also reproduced these views of Venice and Rome in full color woodblock prints. His primary innovation, however, was his adaptation of linear perspective to Japanese subject matter. 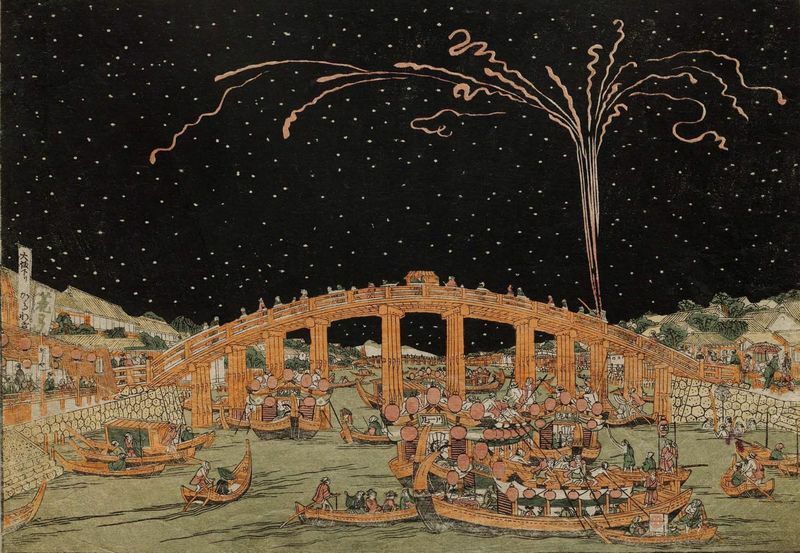 Ryoogokubashi, the most famous sakariba of Edo, was the biggest bridge of the Sumida River. It was surrounded by a hirokooji (broad open space), maintained as a firebreak after the Meireki Fire. Since the early 18th century, this place emerged as the city's foremost center of popular amusement and leisure culture, with various novelties brought to Edo from the Dutch settlement in Nagasaki. Besides, Ryoogokubashi performed as major communication site, having the great geographical advantage of linking roads, waterways and riverbanks into a single complex of gathering and offering a magnificent panorama of Mt. Fuji. The coexistence of two different scales gave to this spot its specific character, as the gathering of nature and city into one harmonic whole: on the one side, the open vista of the river and natural field creating an overflowing sense of freedom, and on the other side, the space within the amusement area organized into misemono (small units of shopping stalls or shows), filled with urban energy and closing off the field of vision. Find more ukiyo-e artists on AvaxHome!